We’d love your help. Let us know what’s wrong with this preview of Bird of Life, Bird of Death by Jonathan Evan Maslow. To ask other readers questions about Bird of Life, Bird of Death, please sign up. Although I classified this book under the sciences, the author being an ornithologist and the book being about his quest for the quetzal, it is just as much about the history of Central America, Guatemala in particular, and its dismal politics, the disappearing quetzal contrasted to the hegemonics of rapacious capitalism and the meddling of successive governments of the United States of America. Fascinating book. 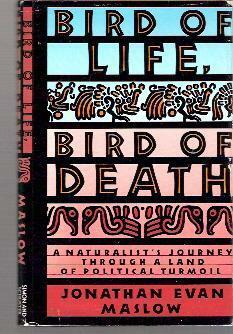 Naturalist Maslow travels trough Guatemala during the reign of dictator Rios Montt, during his search for the bird of paradise Maslow also describes the horrors of modern dicatorship. A little anger isn't bad. When you think of the collection of knaves, brutes, and simple ^$%@#s who rule many of the world's countries, you can get pretty steamed up, especially if you happen to see some of the happy results in person. What would be weird is if you didn't get angry. OK, Jonathan Maslow did go to Guatemala to trace the fate of the quetzal, a long-tailed bird that is not only the national symbol of that troubled Central American nation, but also gives the name to its currency. The quetzal has been important to Central Americans perhaps for thousands of years. Their great green tail plumes of the male bird were traded up and down from New Mexico to Peru. Indian armies believed that the quetzal flew overhead and blessed their endeavors. To kill a quetzal merited the death penalty. Just as the Maya people survived (despite all attempts to wipe them out) in Guatemala and make up more than half the population today, so the quetzal survived as a symbol. There even used to be a Quetzal Restaurant right near here, in Lynn, Mass., run by Guatemalan immigrants. Although I enjoyed this book, I enjoyed it less than I did when I read it in the early 90's after myself returning from a trip to Guatemala where I too visited El Biotopo looking for quetzals. I even took photos of some colorful birds (probably not quetzals) only to discover later that I had black and white film in my camera; Ilford as I recall. The book is part travelogue, and a birding field guide interspersed with asides on political history. As I reread the book, I couldn't help but be remin Although I enjoyed this book, I enjoyed it less than I did when I read it in the early 90's after myself returning from a trip to Guatemala where I too visited El Biotopo looking for quetzals. I even took photos of some colorful birds (probably not quetzals) only to discover later that I had black and white film in my camera; Ilford as I recall. An interesting mix of birdwatching, travelogue, and political commentary, well-written and readable. Given that he traveled with a photographer, however, the absence of pictures is glaring. One of those books I thoroughly enjoyed reading... though using the word "enjoy" for a book with such vivid descriptions of poverty and the impact of a brutal military regime on impoverished Guatemalans seems more than a little wrong. Maslow is a great writer with a gift for original phrasing, sharp observation, keen insight, and able to convey a lot information - birds, politics, Mayan history, agriculture, etc - in a light and easy way. I wish the book were longer. I will certainly re-read it. I need to read this one again - I carried a tattered copy with me on my aimless travels through Guatemala, El Salvador, Nicaragua, Honduras and Costa Rica back in 1986 and 1987 - but it stays with me as a great book, one that was lyrical and informed about Guatemala and also unstinting and raw in the graphic pictures it left in my imagination, especially that of the zopilotes - vultures - feasting on human bodies tossed aside at the city dump, victims of political violence. Recommended to Jean by: Saw in a book club offering. I liked it. But I read it so long ago. The main thing I remember, after all these years, is how the natural environment is not free from the reach of man. In the ensuing years, I have come to believe that the world of man is not outside nature, as much as people would like to believe it is, but that our activities aren't doing us any favors as we are now seeing. From the NYTimes Review: In his introduction, Mr. Maslow suggests the book is "a kind of essay in political ornithology." While correct in believing this is "a field that does not quite exist, at least yet," he demonstrates why naturalists have had to become politically engaged: increasingly, it seems, everything is in peril. If you're into birds, read this. If you're not particularly into birds, read it anyway. It's not really about birds; more the complexities of conquest and division and what's left behind in Central America. It's also sort of a rogue travel book, full of observations, insights and vivid inmages that remain with the reader. I discovered this non-fiction book in the late 1980s, and spent an atmospheric, rainy vacation day, reading about the adventures of two American ornithologists in Guatamala, a very poor Central American country in the midst of a political upheaval. It is one of my favorite reading experiences. Read this during a trip to Guatemala, so very timely. Interesting organization around the bird, good journalistic style and historical background, pretty well-written I thought. Now a bit dated, but still a fascinating tale of natural beauty amid the storm of political destruction in modern Guatemala. This is a book about some guy trying to find a quetzal. Read it and learn about quetzals.